In the fall of 1991, Professor of Special Education E. Paula Crowley and student leader Amy Haste Given ’92 launched the first university chapter of Best Buddies in Illinois. The Illinois State University Chapter of Best Buddies has a long history of awards and has twice been recognized as an Outstanding Chapter at the International level. Crowley considers herself fortunate to have found Given, who was integral to getting the organization off of the ground. In the 23 years since, Crowley has collaborated with students and the Bloomington-Normal community to help grow and improve the organization each year. Best Buddies is an international nonprofit organization built upon the generosity of thousands of volunteers around the globe who are dedicated to enriching the lives of individuals with intellectual and/or developmental disabilities. The organization “pairs” volunteers with members of the community who have intellectual disabilities. The two then grow a meaningful and mutually beneficial friendship and participate in monthly socials with the entire Best Buddies community. In recent years, Best Buddies has consistently signed-up more than 100 college and associate buddy members and up to 100 individuals with special needs from the community. Part of the membership requirement in Best Buddies is attendance at the monthly meetings and socials. To accommodate these events, the organization reserves some of the University’s largest venues such as the Bowling and Billiards Center and rooms within the Bone Student Center. The career goals among the students who join the organization run the gamut. For example, Best Buddies co-directors have two different majors. Joseph Powers is a biological sciences major, while Allyssa Massarelli is an education major. 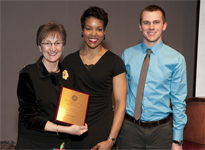 Best Buddies was recognized as the 2012-2013 most Outstanding Established Program on the Illinois State campus. The ability for a student enrolled in a major unrelated to special education to play such an important role in Best Buddies is a testament not only to the organization’s accessibility but also to its humanity. “There’s something very genuine about Best Buddies,” Crowley said. “Our students extend themselves and befriend someone with a different life experience. There is no shortage of social settings and activities where buddies spend time with each other each week. They may talk on the phone, hang out at the their buddy’s apartment, attend basketball games, go bowling together, share in meals, take shopping trips, watch films, collaborate during the organization’s annual fundraisers, and get involved in service projects to better the community. This past fall, one of the group get-togethers that the members scheduled was at Uptown Normal’s Firehouse restaurant for pizza and conversation. Reflecting upon the event, Crowley considers what the other restaurant-goers might have been thinking that day when they saw Illinois State students engaged with their community buddies. Like Crowley, student members recognize that not everybody understands that individuals with intellectual disabilities have full lives much like any other person. Through the relationships with their buddies, Crowley says students gain a great appreciation for the exposure to the lifestyles of people with special needs. This experience helps students to understand what they take for granted in their own lives, and they often learn to become better individuals, as well. Crowley says that the impact these students have on the lives of individuals with special needs also cannot be overstated. And these individuals recognize the value of Best Buddies, too. Crowley says that some community members have continued to be involved since the early 1990s. “Many would really miss the Best Buddies if they were no longer involved,” said Crowley. Crowley continues to be encouraged by the benefits derived by members from their involvement in Best Buddies. And the goal is for carryover into every aspect of their lives. “I believe that beyond Best Buddies, our students and our community buddies gain an increased sense of being a part of the community and that that they have an increased sense of their own integrity as human beings with a part to play in the world,” said Crowley. For those interested in committing time to the Best Buddies chapter at the University and throughout Illinois, please visit the RSO’s Facebook page and the Best Buddies Illinois website. And check out the International not-for-profit’s interview of Illinois State’s own Joseph Powers on page seven of the latest issue of their biannual magazine, ByLine.